What would your high bid buy? “The possibilities,” the seller said, “are endless… As long as it isn’t against the law, I’ll do or say whatever you want until someone comes and drags me away. And it will take a few of them. I’m a biggun.” Bidding started at one penny. We went to chat to learn more. Me: What were you doing before you got laid off and how long have you been out of work? Joe The Greenskeeper: I’m Joe The Plumber’s cousin, Joe The Greenskeeper. I guess when people had to choose between golfing and surviving, they sold their clubs. Me: Obama loves golfing. Have you looked for other work? Joe The Greenskeeper: I took a job the day I was laid off, delivering pizza 4 nights a week. I’m also selling everything I can on eBay, and doing odd jobs. I never said I was starving or losing my home. Fortunately everything is paid for, but I’m still struggling on a lot less than i was making. Me: Why Romney? Why not Gingrich or another candidate? Do you think Romney’s plan to create jobs will help? Joe The Greenskeeper: The auction offer is sincere. 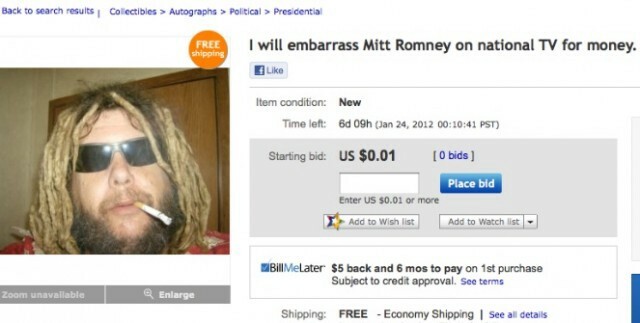 I chose Romney because he’s made millions at the expense of others. The way Bain operated was to take over a company already struggling, pay each other HUGE management fees, consulting fees, and bonuses, knowing all along the plan was to run up the bills, bankrupt it all, and move on. Not only was he costing people their jobs, he was screwing the government on the bankruptcy deal. He’s made millions doing this, up to 20 million in one day. So, no I don’t believe in his jobs bill. Based on his past record he’s much better and dissolving jobs than creating them, and I wouldn’t vote for him if he was running for whorehouse pooper mopper. I think it’s time for someone to make a few bucks at his expense. As far as people not taking me seriously, I don’t really care. People used to call up Alexander Graham Bell and laugh at him over the phone. Joe The Greenskeeper: Sure, leave the personal income tax where it is, the country was doing ok with that rate until the economy tanked. Lower the corporate tax to where manufacturing is profitable again, do that and you create jobs, create more jobs and more revenue will be generated, and eventually the cycle should catch up to itself and things will improve. Me: Did you vote for Obama? Joe The Greenskeeper: I did not vote for The ObamaLamaDing-Dong. He’s a nice guy, and I find him sincere, but not right for America at the time, nor is he now. I’m tired of voting AGAINST someone. I want a candidate that i can vote FOR. Me: Are there any candidates you think you might support? Me: The original Colbert. Sounds like Stephen can count on you for a write-in? You seem to have given up on the political process. Joe The Greenskeeper: I’ve not given up on the political process forever, just until 2016. Me: Do you think it will be better by 2016? Joe The Greenskeeper: I don’t think it will be better by 2016, but that’s the next opportunity for America to do something about it. After a day, eBay pulled the listing. Ron said it was “because eBay felt I wasn’t really selling a product or a service, but a political opinion.” Sounds like there’s a good chance he might get back on and re-list his services for hire on eBay, if he abides by certain rules. But meanwhile, he still needs the money, so the offer stands. You can email him at rollingstoned@bellsouth.net. Abe Sauer is the author of the book How to be: North Dakota. He is on Twitter. Email him at abesauer @ gmail.com.